The Post Production Transactions application updates inventory levels of component and parent items based on production reported in the Production Transaction Processing application. Specifically, it adjusts the Quantity On Hand and Quantity On Order fields for produced items and the Quantity On Hand and Quantity Allocated fields for component items in the Inventory Item File. Appropriate distributions are also created in the I/M Distribution To G/L File. Normal transaction processing will generate credits for the work-in-process account (if WIP was selected when work orders were printed) and debits for the appropriate finished goods asset account. Over-production reporting, or not setting the Increase WIP? flag to Y when printing production work orders, will result in the creation of credits for the asset accounts associated with the feature option and/or component items and a debit to the finished good asset account. A transaction posting which completes an order prior to fulfilling the entire order quantity (under-production) will cause the creation of debits to the asset accounts for the appropriate feature options and/or components along with an offsetting credit to the work-in-process account. For more information on over-production and under-production see the Production Transaction Processing section of this manual. During Posting, the application will create standard cost variance distributions in G/L if I/M Setup is set for standard costing. Distributions will only be created for production transactions where a discrepancy exists between the standard cost of the finished good and the sum of the components costs, and only if a purchase price variance account number has been entered in the Material Cost Type/Loc file for the material cost type of the finished good. Before posting, it is recommended to print the edit list in the Production Transaction Processing application to verify exactly what transactions are on file. When a posting is performed, the system prints a journal of all transactions that were posted. * Select the desired mode from the Post Production Transactions menu bar. Enter the cutoff date for transactions to be posted. Only transactions with production dates on or before this date will be posted. Defaults to the system date. If the transactions do not need to be reviewed, you can post the production immediately after creating it. This needs to be enabled in BOMP Global Setup in fields 4, Enable Immediate Production Trx Posting, and 21, Immediately Post Completed Scan Trx for +WO. 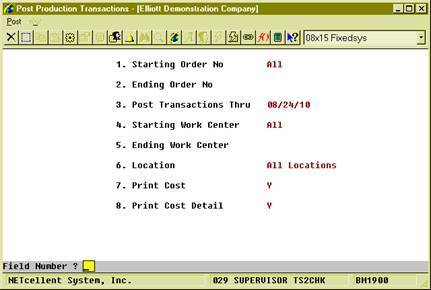 The first turns on the feature in the Production Transaction Processing screen and the second enables the feature in Work Order Production. With this feature enabled, you will be prompted with “Do You Want To Post Immediately” once you have finished reporting a transaction. Selecting “Yes” will bring up the Print Options window for the post journal destination. The system will provide a warning and solution if an exception occurs. If the exception is not handled, the system will not post the transaction immediately. Review the exceptions in the transaction edit list and correct them or override all exceptions before posting again. If the transaction will close the order, the system will post all transactions of the order. Transactions can be reviewed through the edit list before posting them as a batch. The post will allow you to select a range of work orders, dates, work centers and locations of the transactions, as well as the level of detail to print on the journal. The start and end of the range of order numbers. Defaults to All. 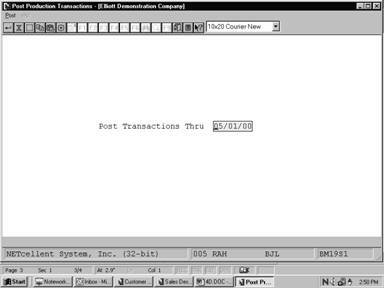 Selects transactions with a transaction date on or before this date. The start and end of the range of work centers. Defaults to All. 2 alpha-numeric digits with wildcard support. Enter “Y” to print cost on the post journal. This flag is subject to several security flags and BOMP Setup. If the user is not authorized to view cost, this option will not be available. Enter “Y” to print cost detail on the post journal. This cost details how the system calculates production cost in the Y Count Point. The system will list cost distributed from each operation and material. Once a transaction is posted, it cannot be changed. However, WO+ provides a way to fix a bad transaction if it may cause serious problems. A transaction can be created with the opposite value of one posted. 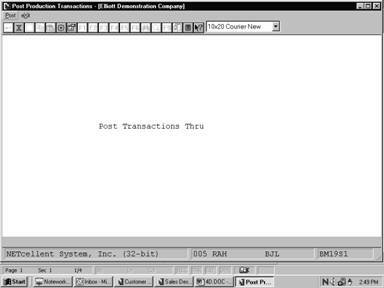 This transaction is called a Reverse Transaction and can be created in the Production Transaction Processing screen. This transaction will attempt to reverse most of the changes made by the bad transaction, including quantity, hours, distributions, and materials. However, it cannot recover 100% of the data to the status before the post due to the complexity of the transactions. For example, it cannot recover changed average cost and last cost, issued serial number or printed transfer batch. You should avoid using this often, but it can be used to deal with serious problems.